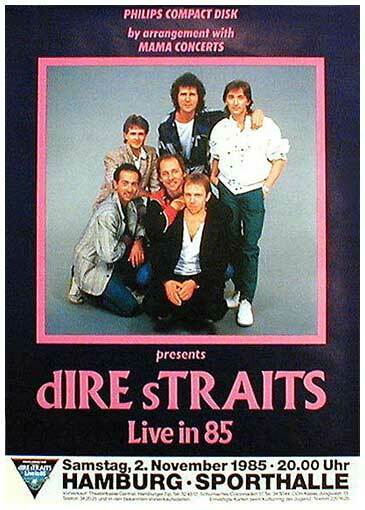 After recording the Brothers in arms album in Montserrat, Dire Straits rehearsed between 5th and 13th April 1985 in Dubrovnik and between 14th and 26th April in Split. 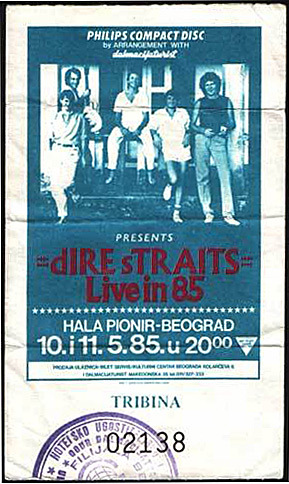 The first real concert of the immense world tour was on the 25th April in Split, former Yugoslavia. 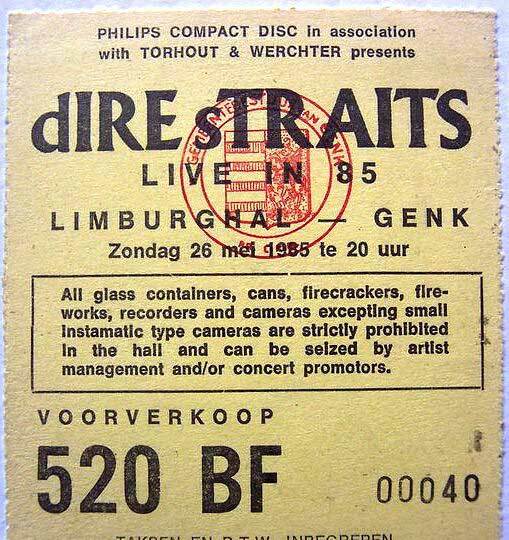 Again some changes in the tour line-up: Hal Lindes was replaced by Jack Sonni and Mel Collins was replaced by Chris White. 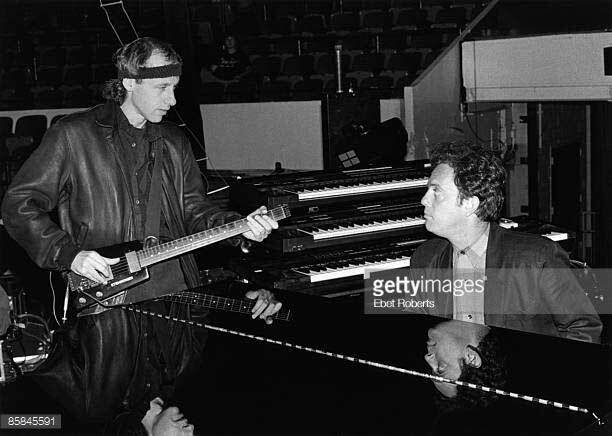 Tommy Mandel left and Guy Fletcher joined the band. 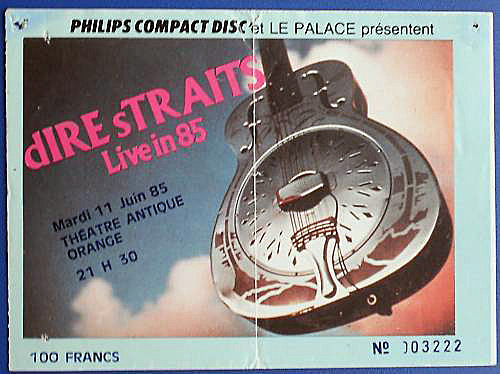 Several guest players appeared during the tour: Eric Clapton, Paul Young, Hank B. Marvin, J.J. Cale, Sting, Billy Joel, David Sandborn, Branford Marsalis, Paul Brady, Dave Edmunds, Nils Lofgren, Francis Rossi, T-Bone Burnett and Pete Townshend. 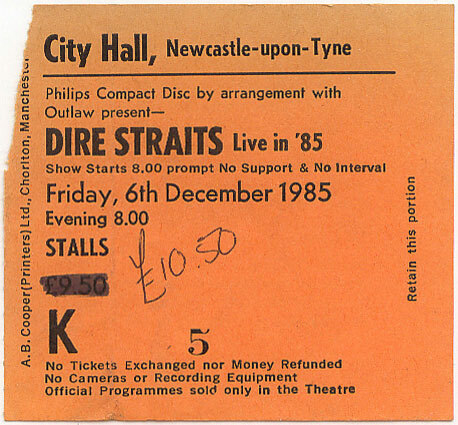 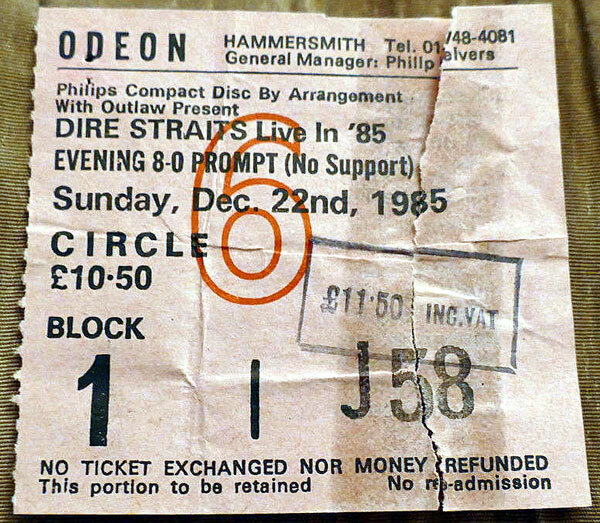 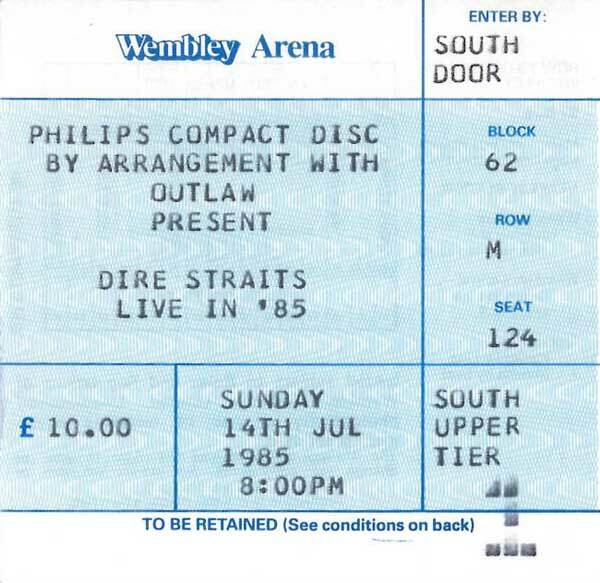 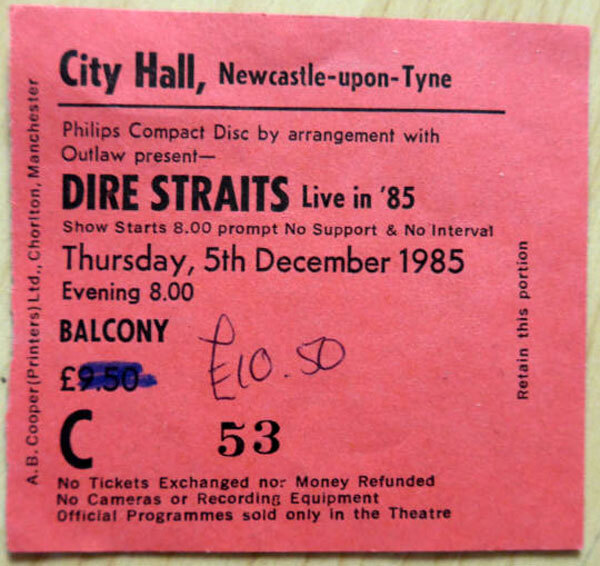 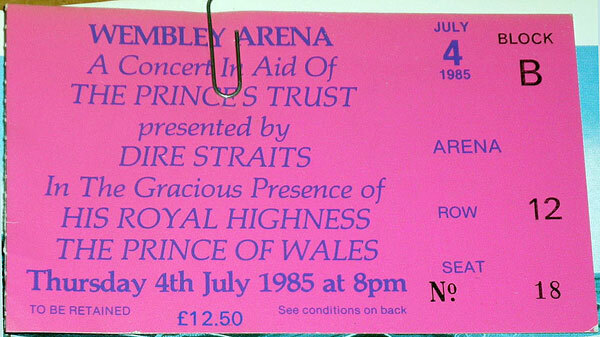 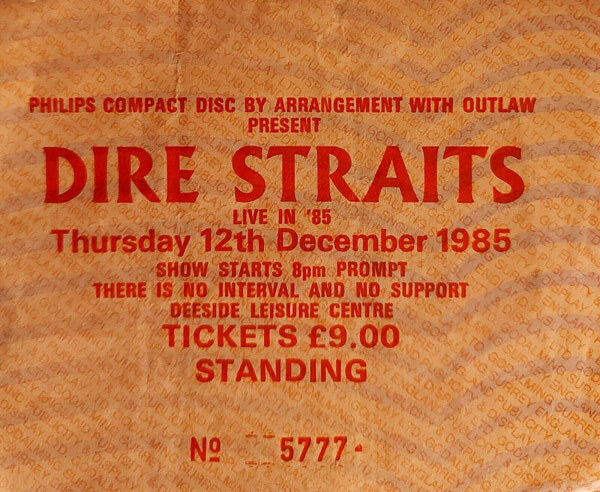 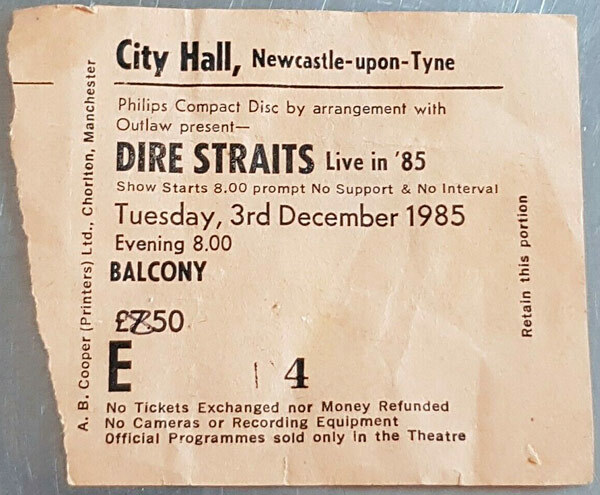 On 4th July 1985, Dire Straits performed at the Prince's Trust Rock Gala and donated all their royalties from that evening to the trust. 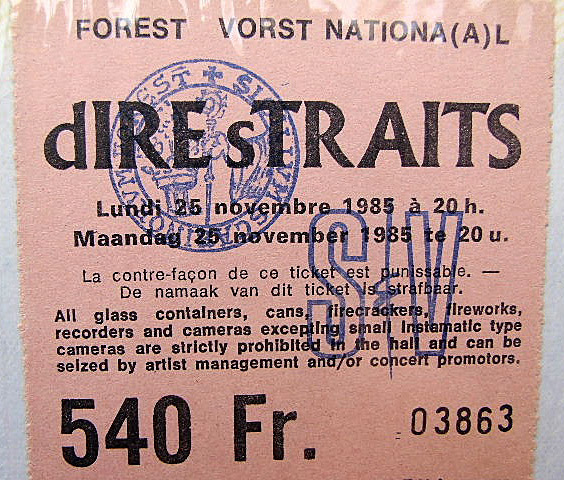 For this show, a separate programme was made, which can be found in the tourbooks section. 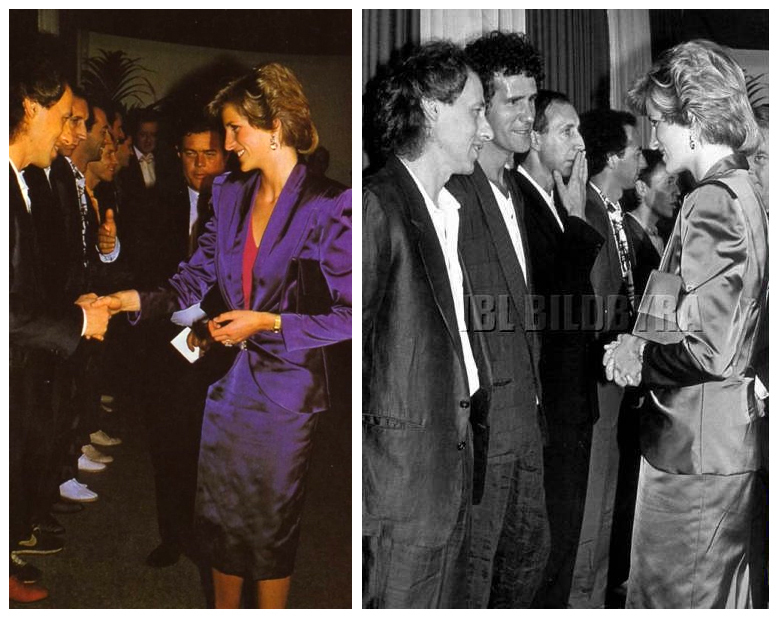 The band also met Prince Charles and Princess Diana that evening. 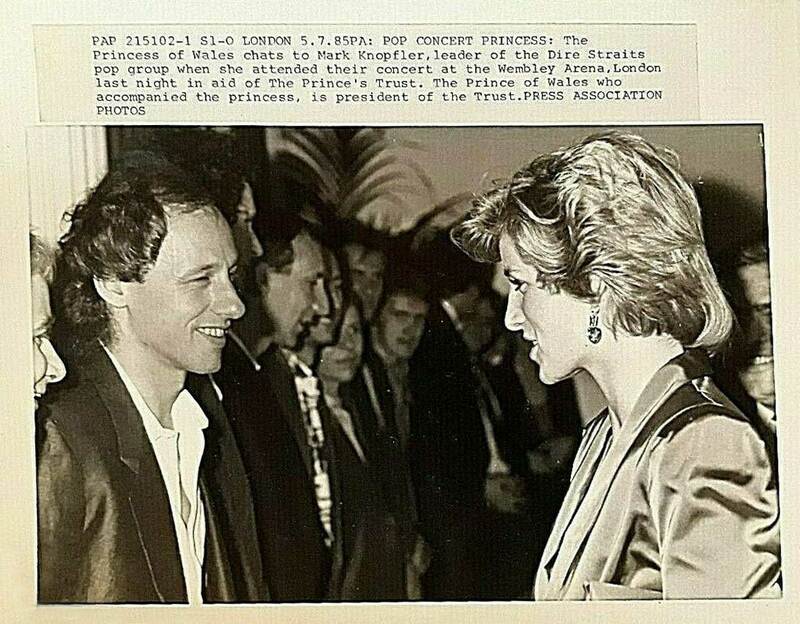 Click here for another nice picture of Mark and Diana. 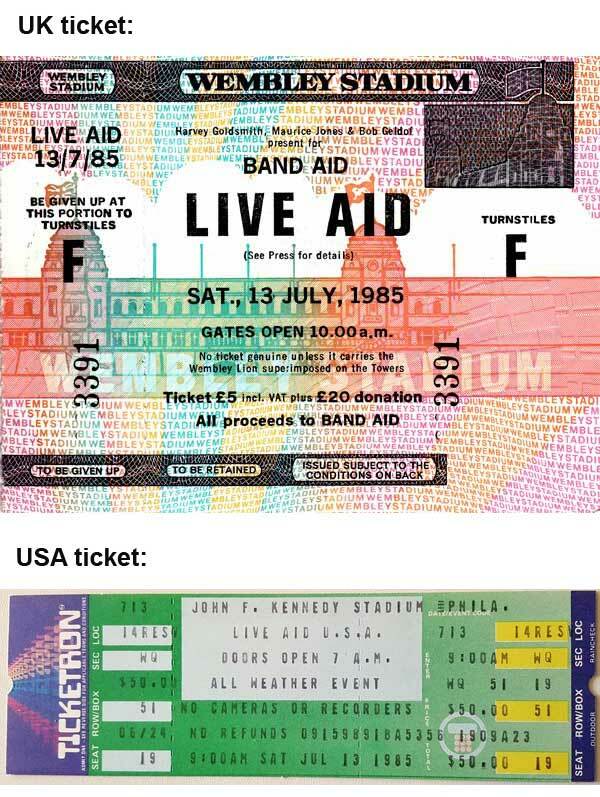 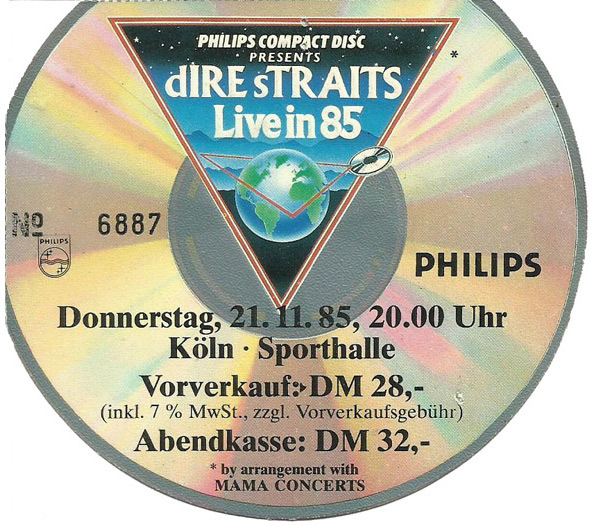 During this tour, they also made an appearance on the famous Live Aid 1985 show (13th July), playing two songs (Money for nothing featuring Sting and Sultans of swing) in the afternoon at Wembley Stadium, and returning to Wembley Arena that same evening for another concert of their own tour. 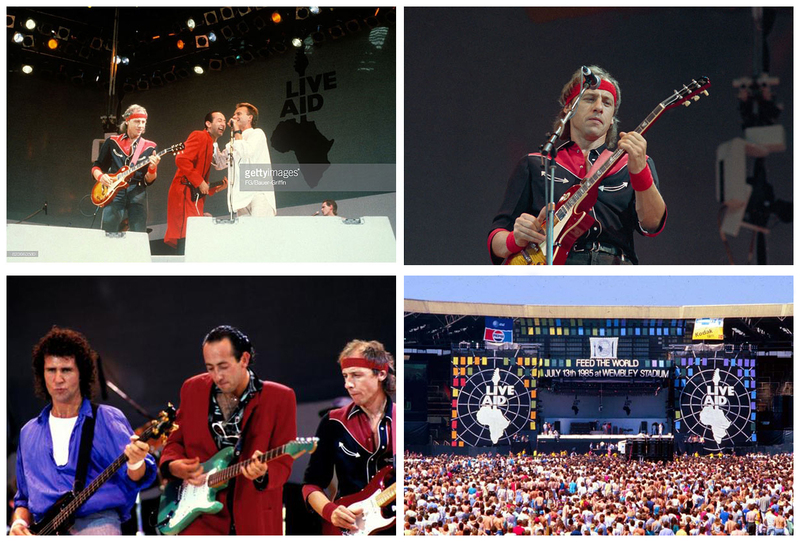 Over one billion people watched the Live Aid show! 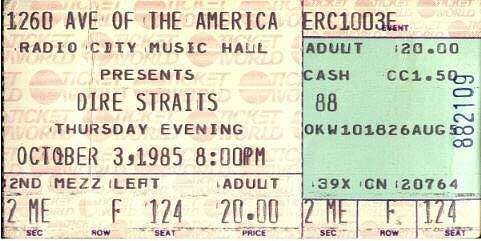 Mid September 1985, Mark Knopfler came to the Sweetwater Cafe, San Francisco to see J.J. Cale peform. 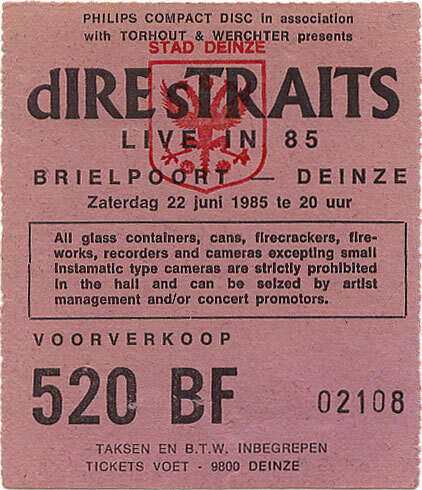 Mark was invited to play on stage as a special guest. 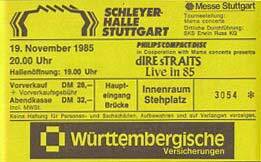 Looking at the very tight touring schedule of Dire Straits, it was most likely on the 16th September. 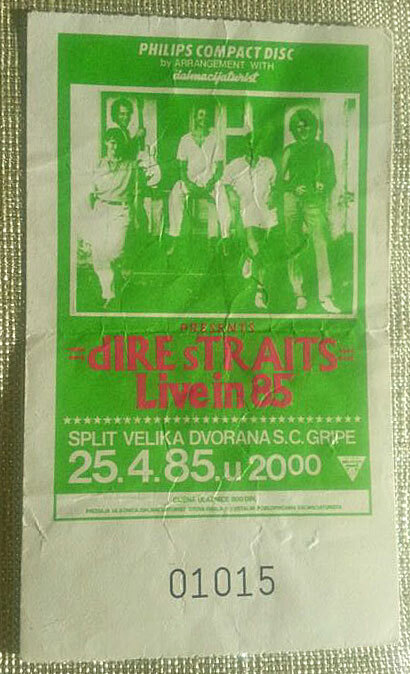 There is one picture of this very rare guest performance. 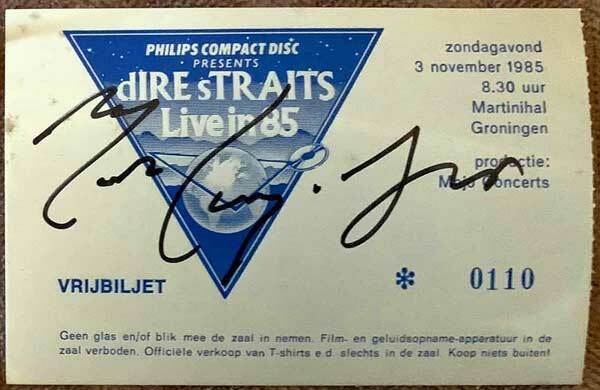 J.J. Cale always dated his autographs, it says 1988 on it but that is most likely the date when it was signed. 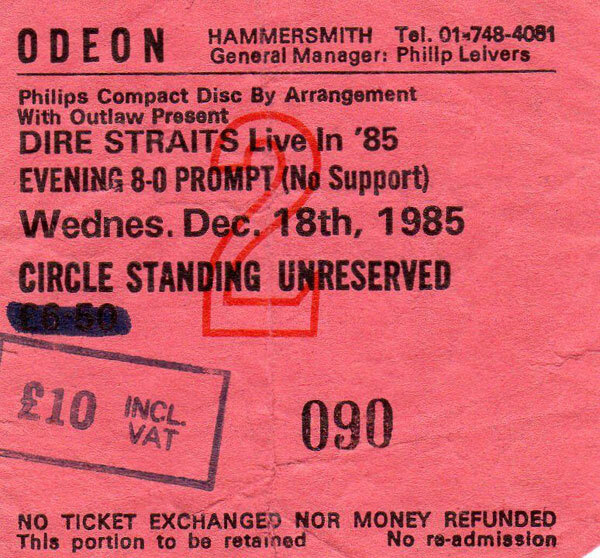 On 18th December 1985, J.J. Cale returned the favour and joined Dire Straits on stage at the Hammersmith Odeon, London, UK. 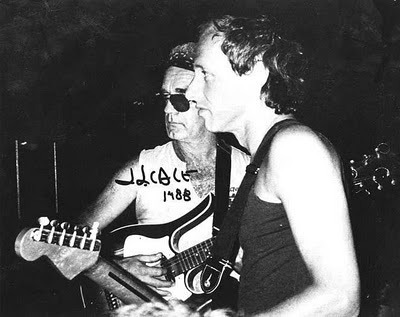 Sadly, J.J. Cale passed away on 26th July 2013. 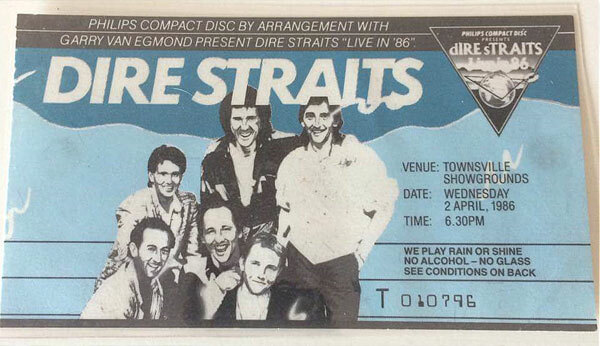 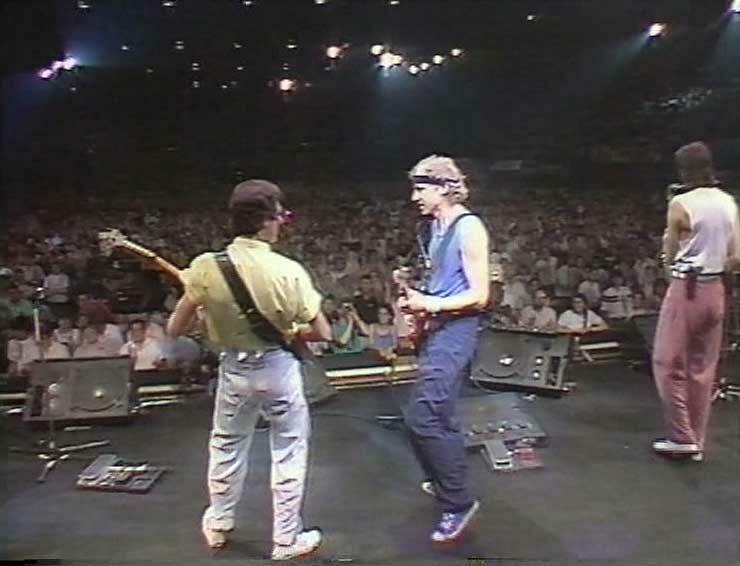 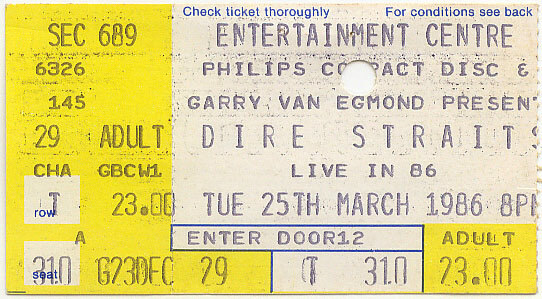 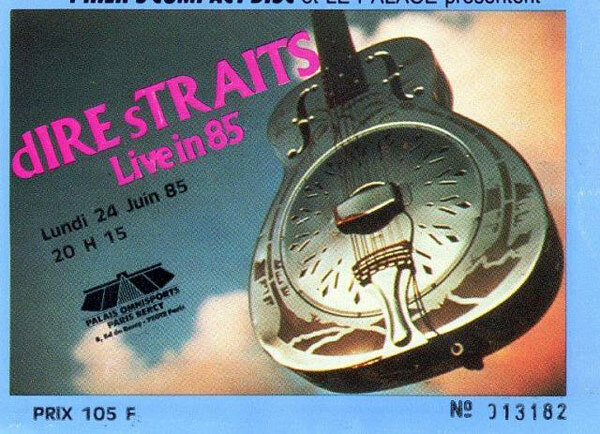 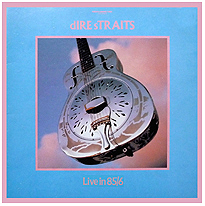 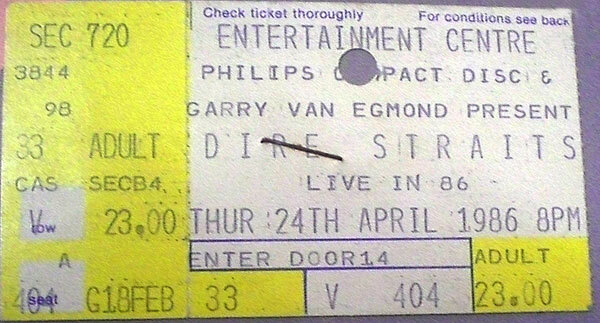 Since there was so much demand for tickets and the tour had to come to an end, Dire Straits gave their permission to broadcast their final show from the tour (Sydney, 26th April 1986) live on national television in both Australia and New Zealand. 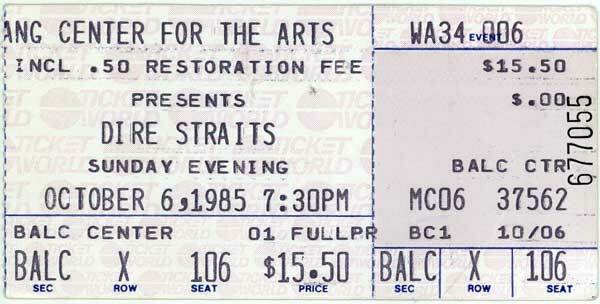 That night, Dire Straits donated 50.000 Dollars to the anti-drug campaign in Australia. It was a great last show, including the 12.000 strong audience singing Waltzing Mathilda for the band and the following speech from Mark Knopfler in which he thanks the band, road crew, the local promotor, Dire Straits' management and the people from Australia and New Zealand. 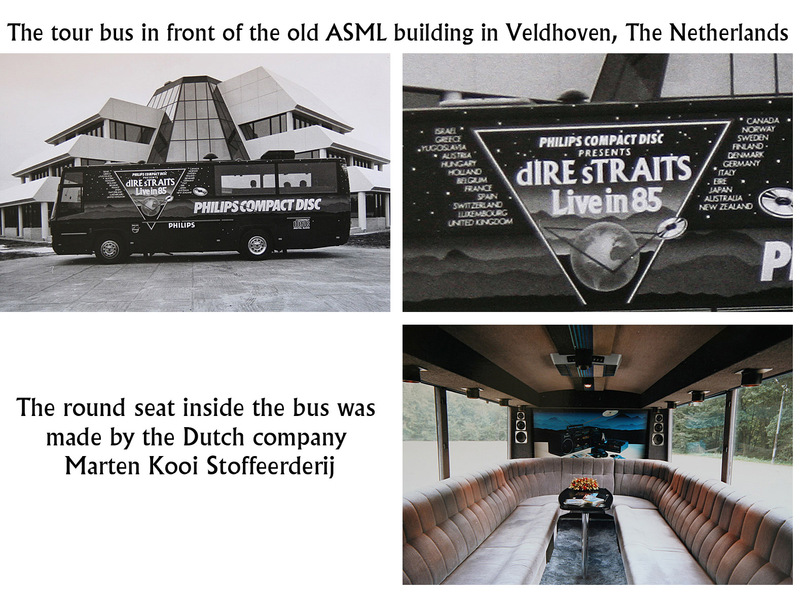 Originally, Japan was one of the countries that the band planned to visit early 1986, the country was also listed on the tour bus the band used. 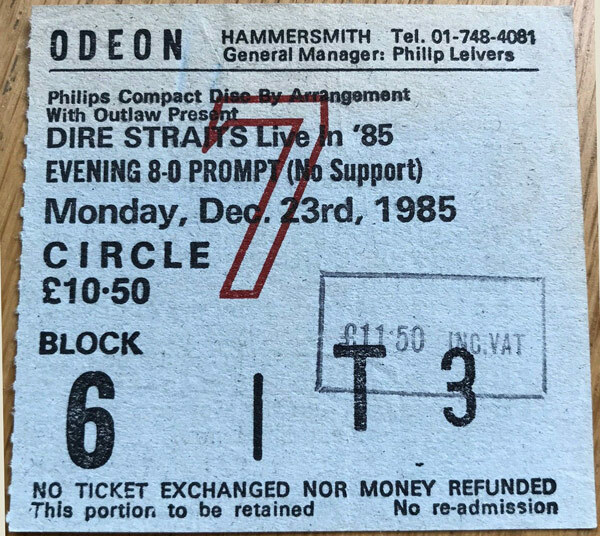 But the D.S.I.S. 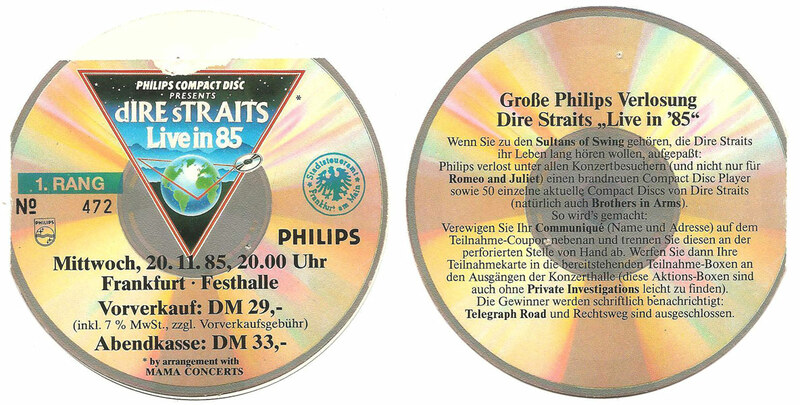 newsletter from May 1987 made it clear that Japan was not visited after all. 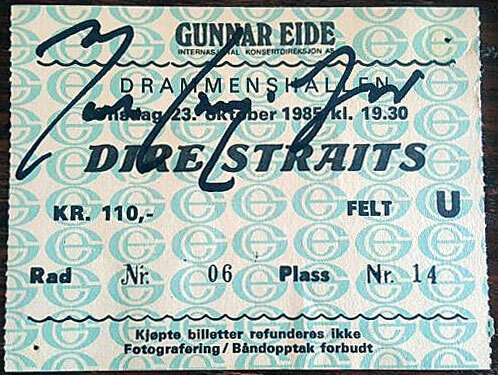 In April 2013, Guy Fletcher also confirmed on his forum that Dire Straits did not visit Japan in 1986. 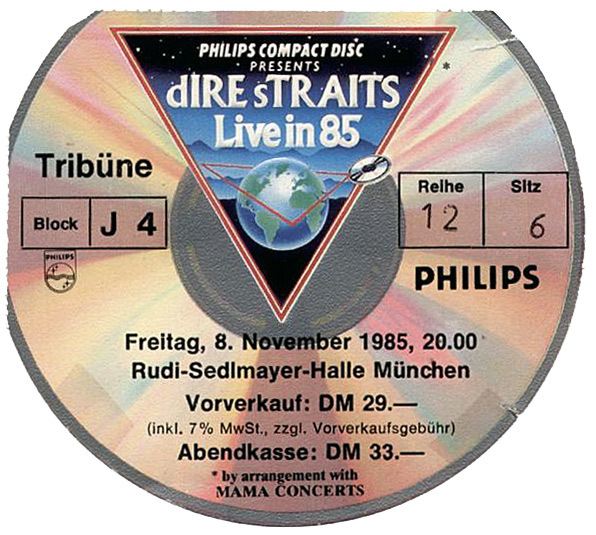 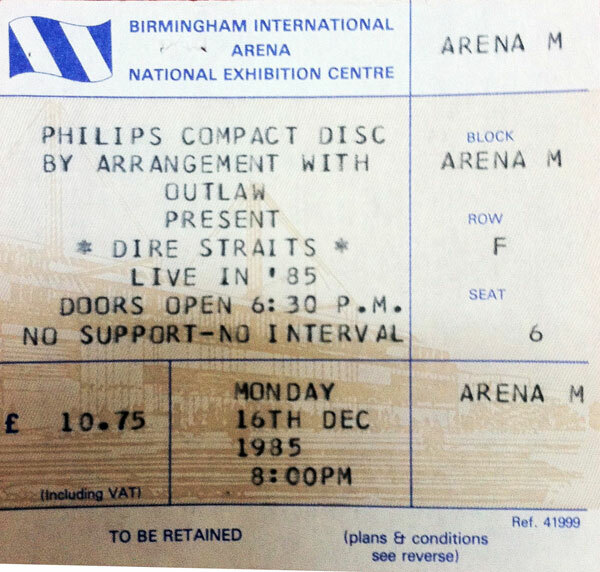 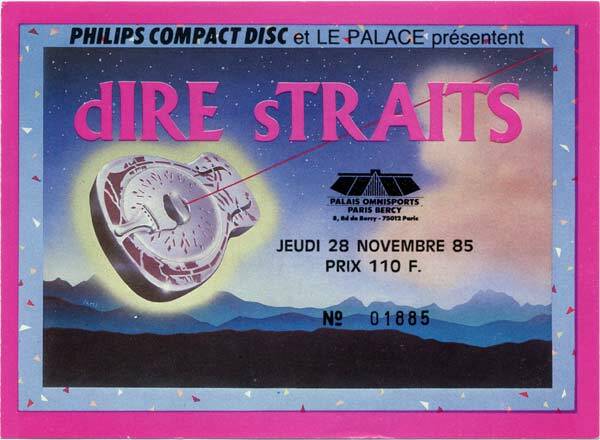 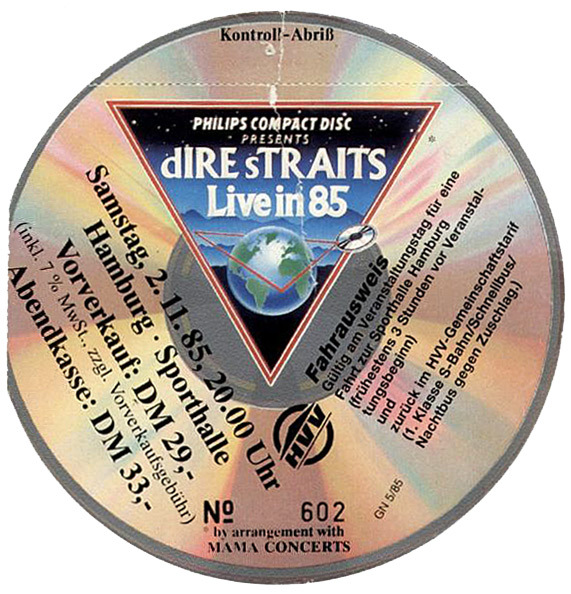 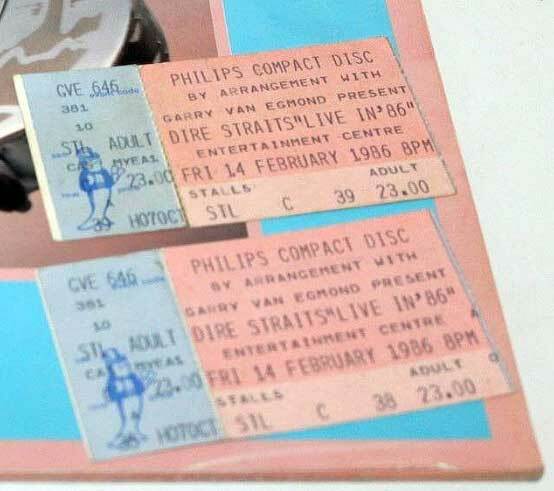 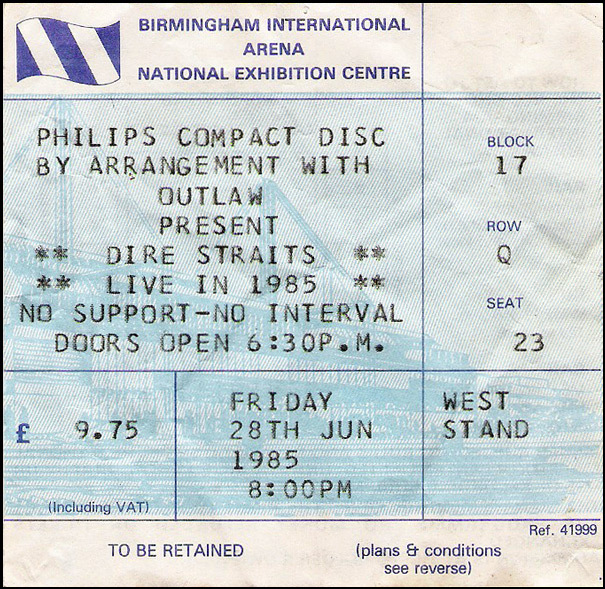 The tour was sponsored by Philips and was the big worldwide introduction to the new digital format for music: the Compact Disc. 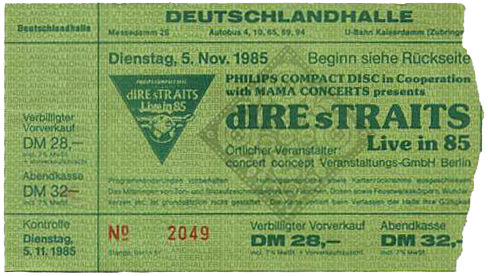 Not much later, Brothers in arms was the first record to sell a million copies on CD format. 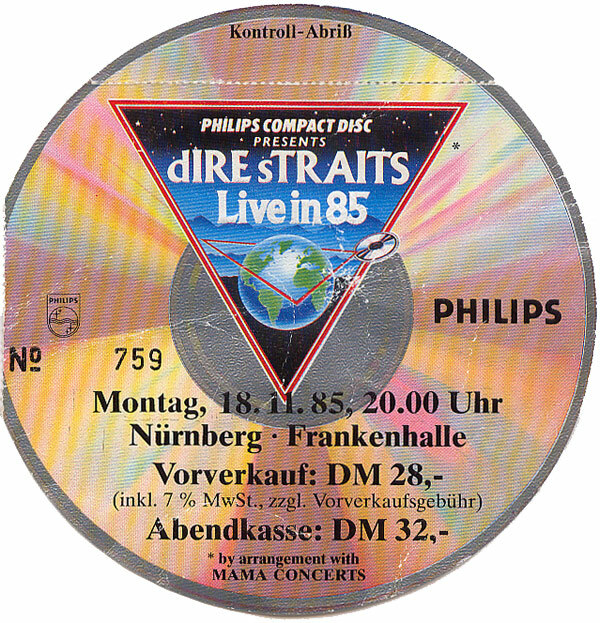 The tour, also referred to as Live in 85/6 took the band all around the globe and they visited 117 cities in 23 countries. 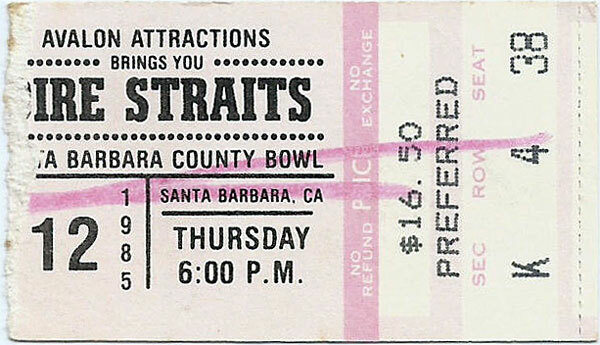 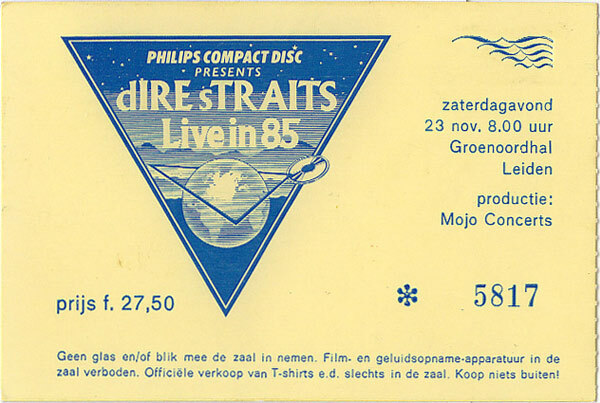 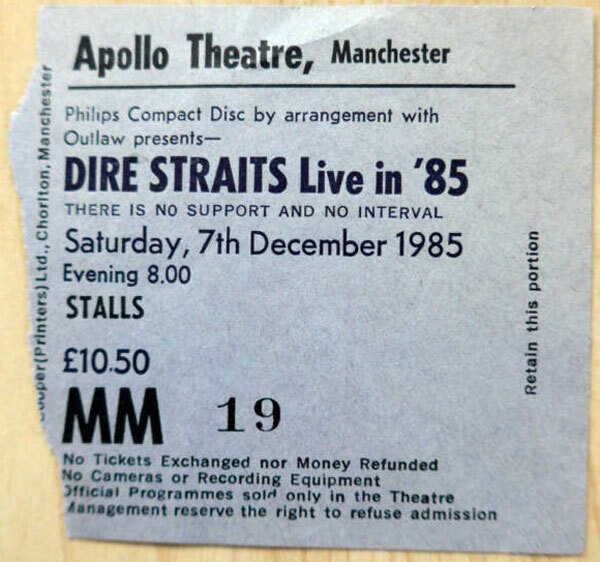 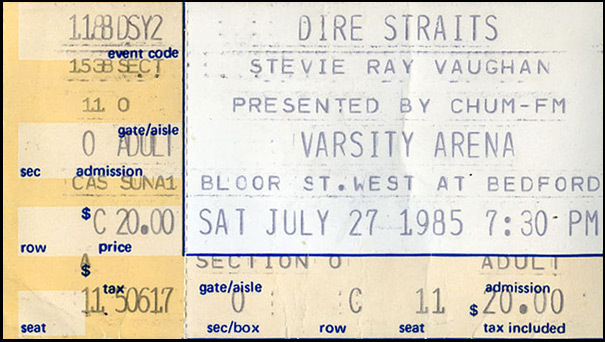 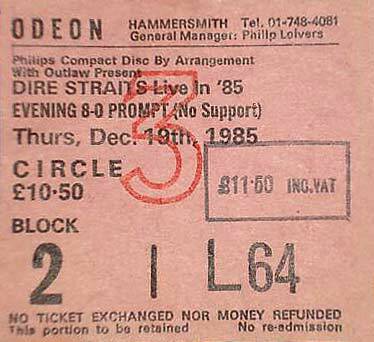 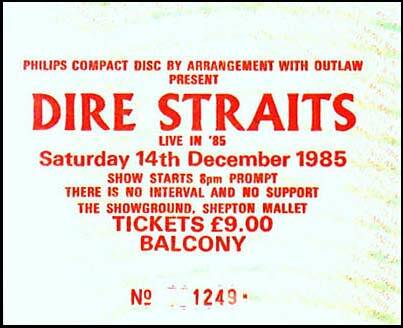 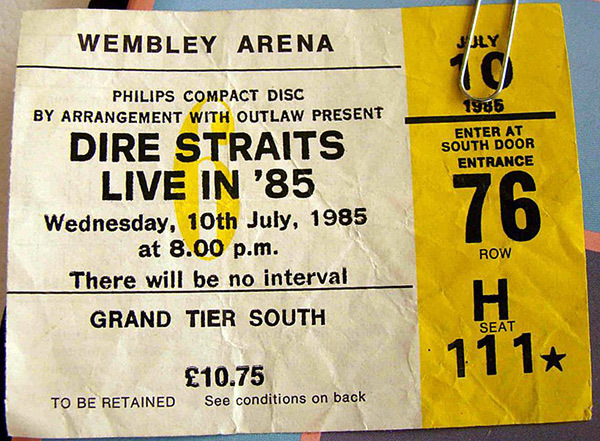 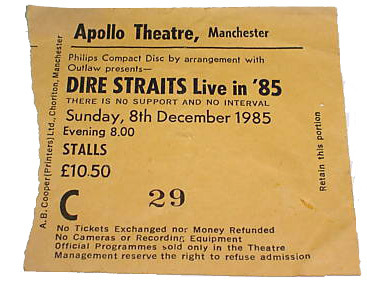 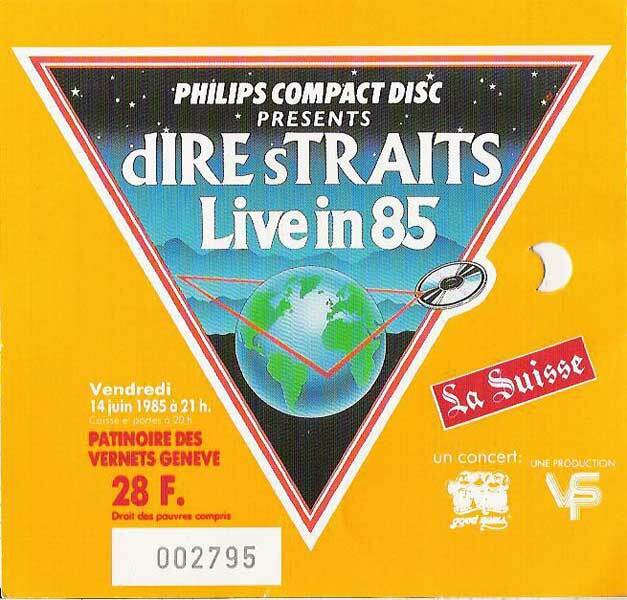 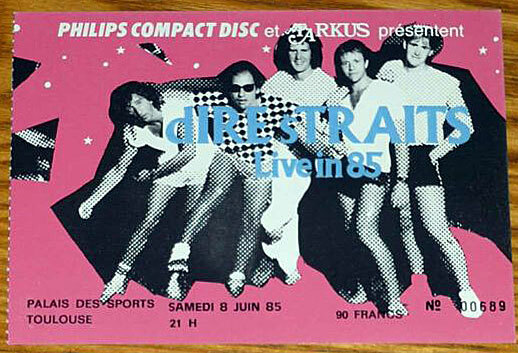 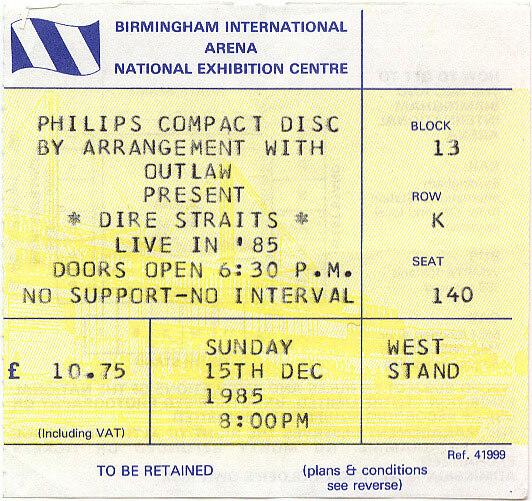 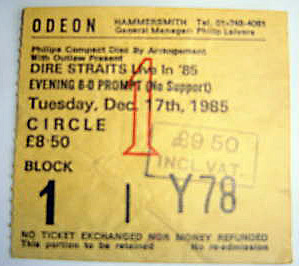 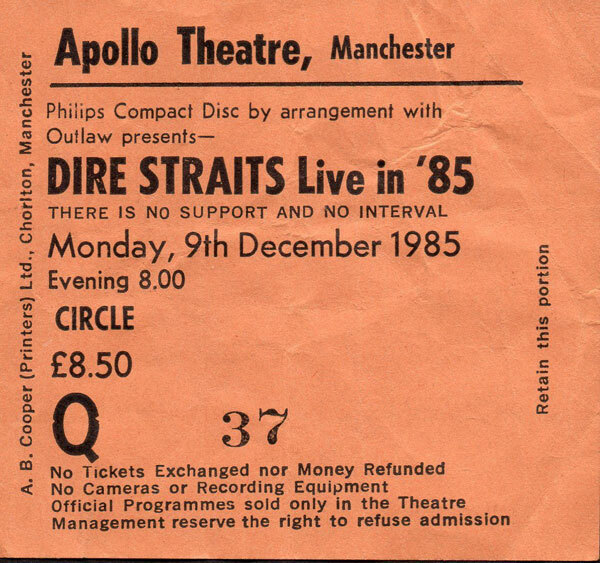 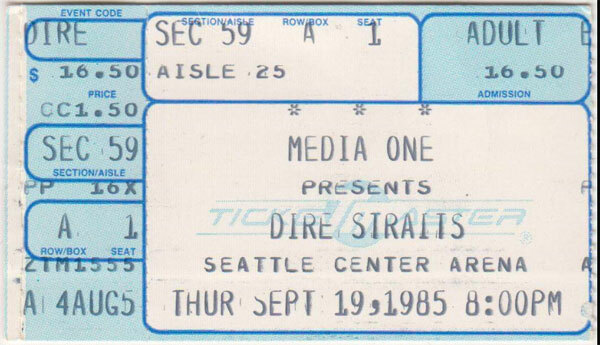 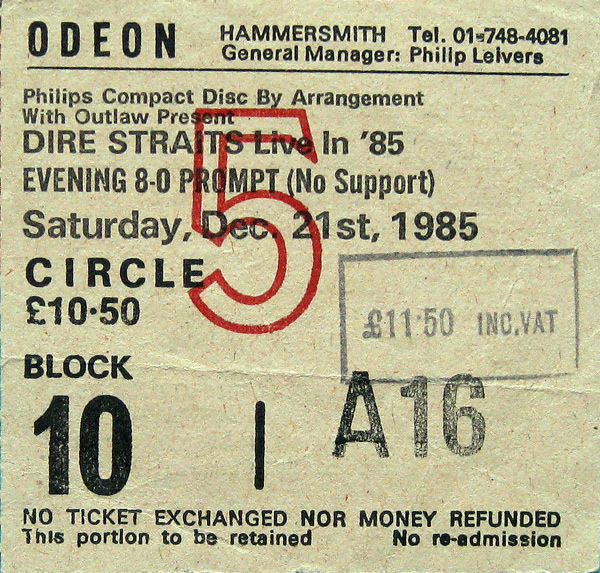 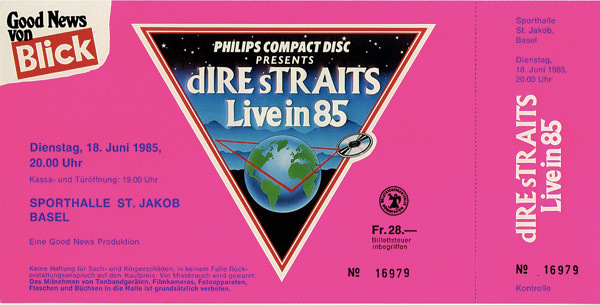 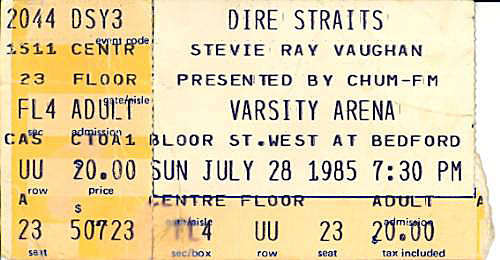 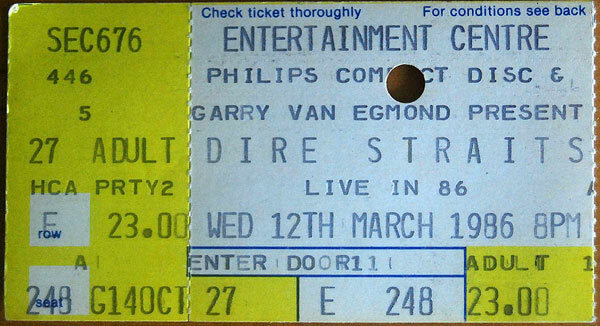 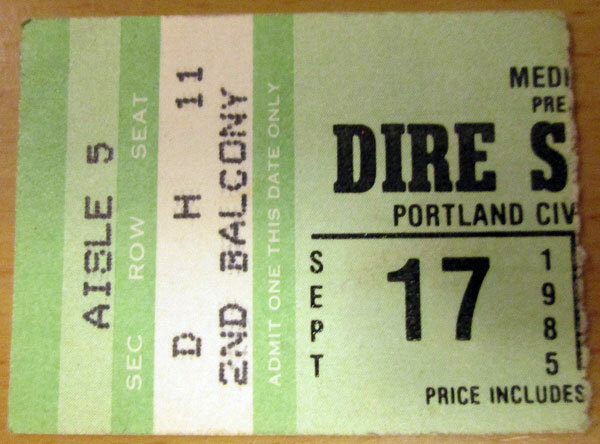 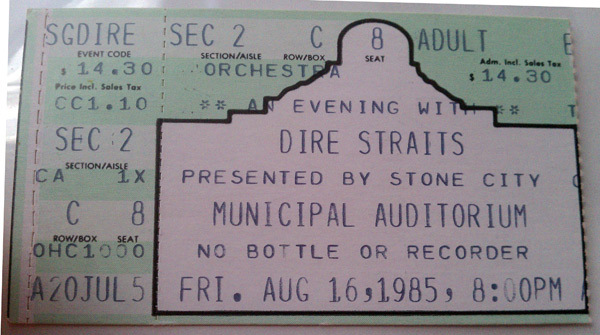 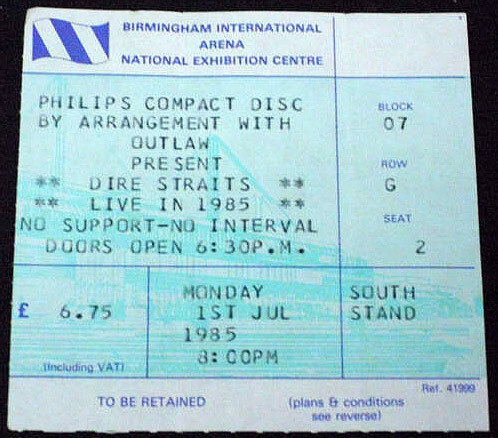 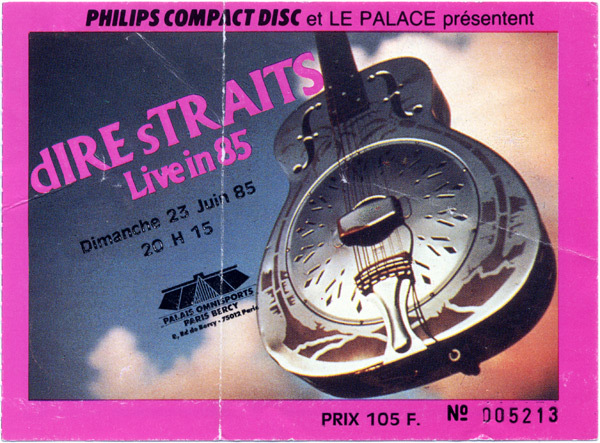 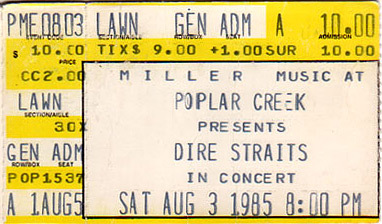 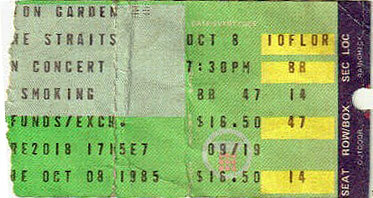 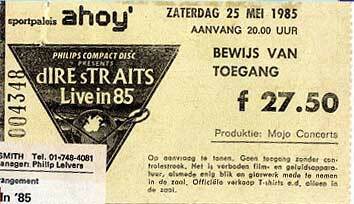 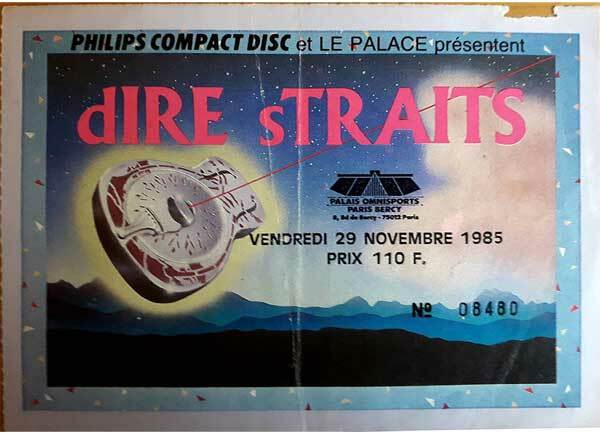 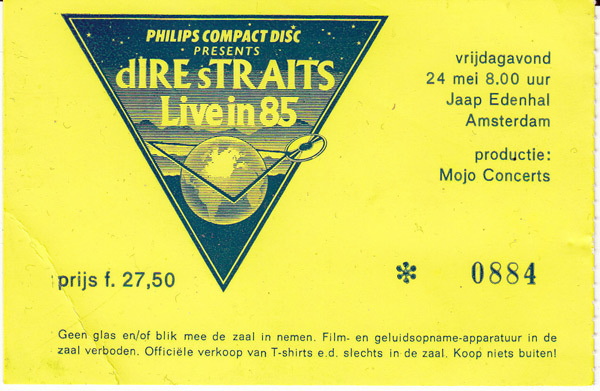 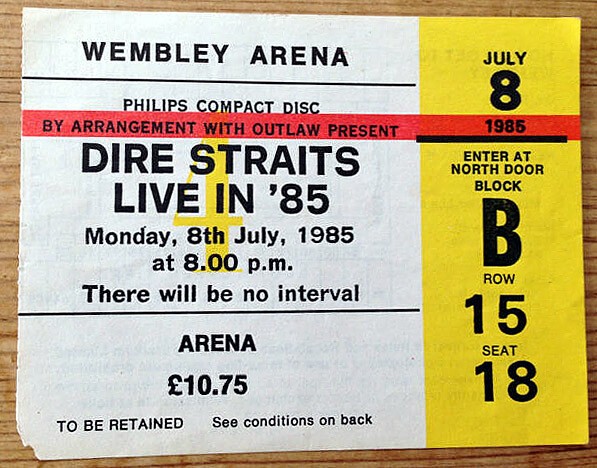 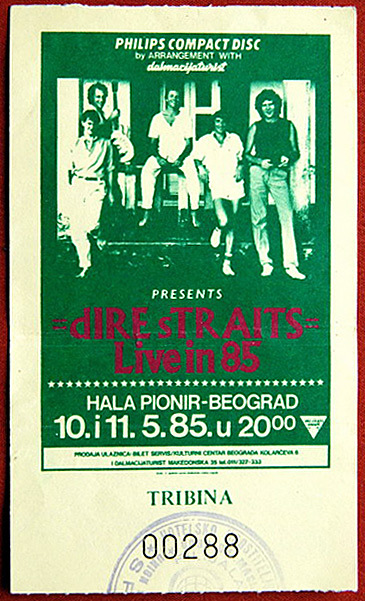 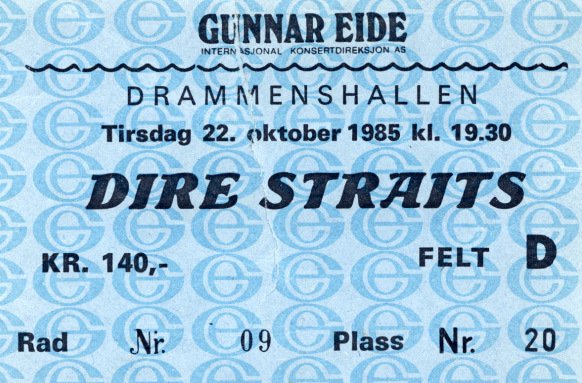 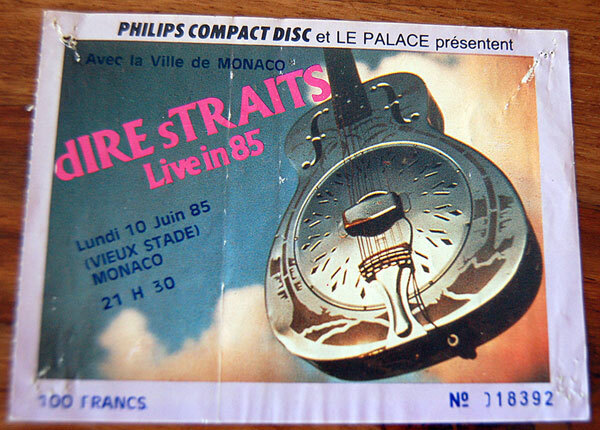 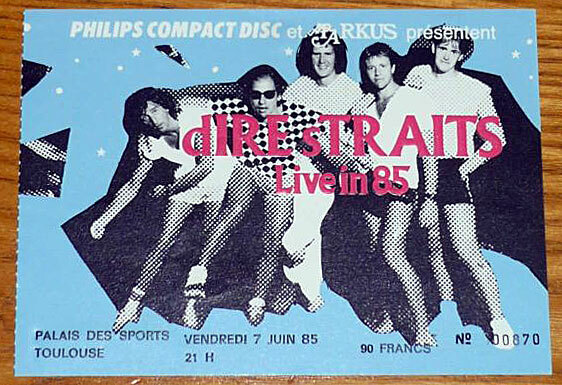 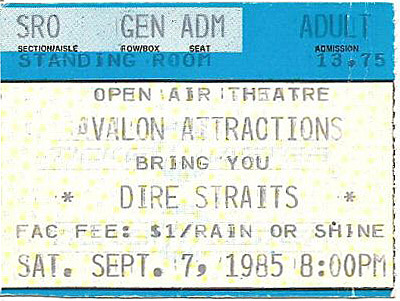 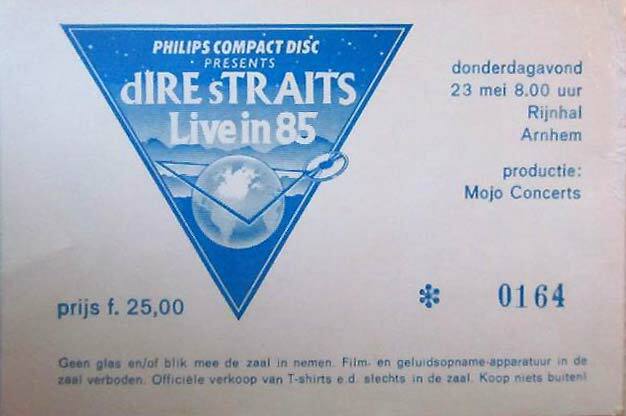 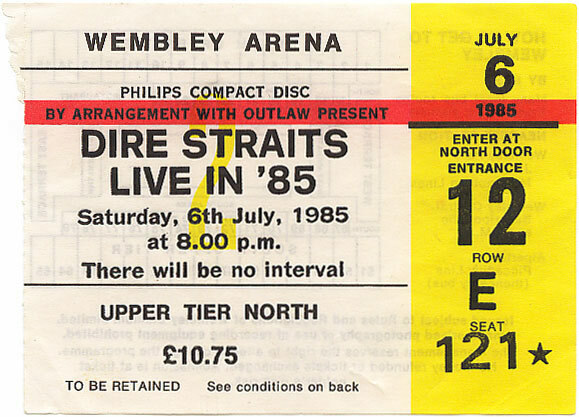 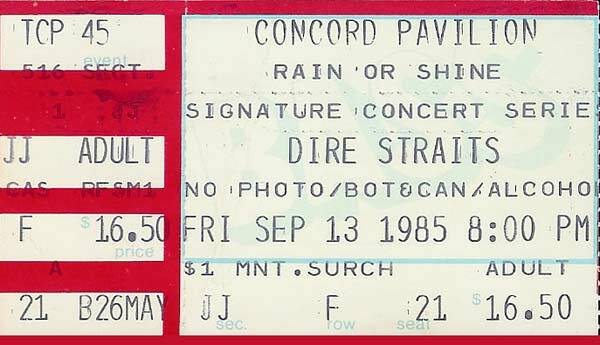 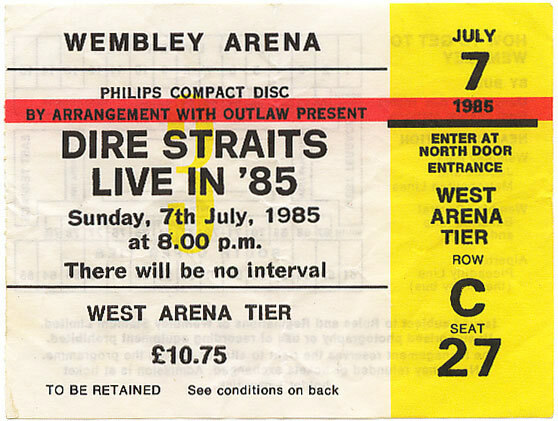 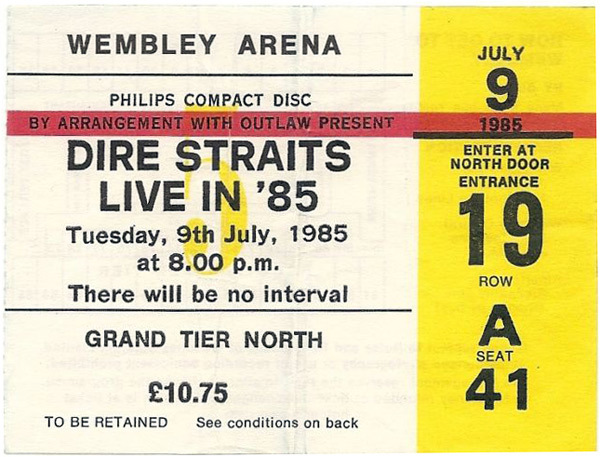 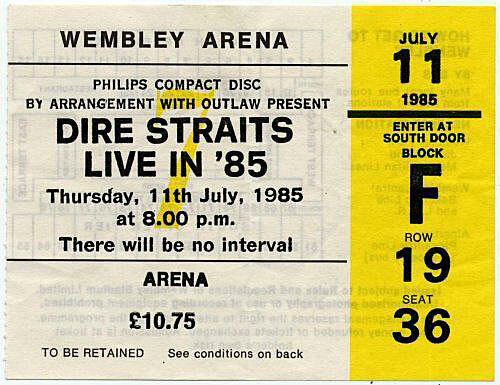 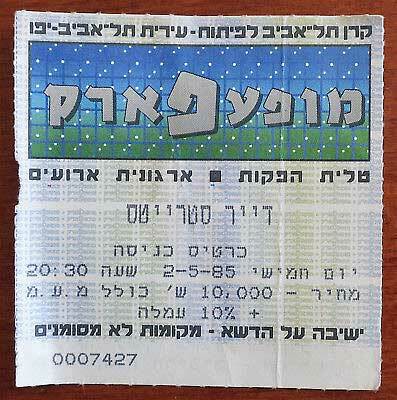 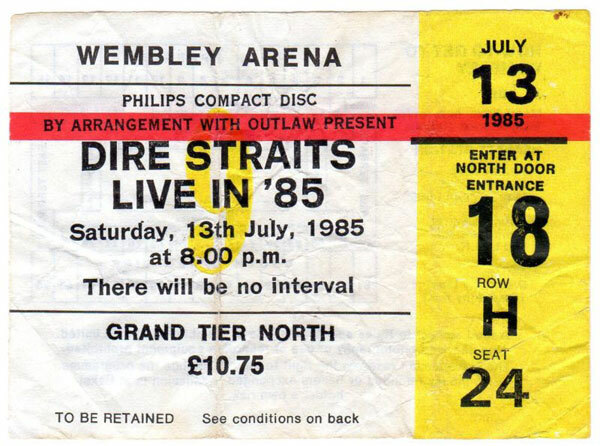 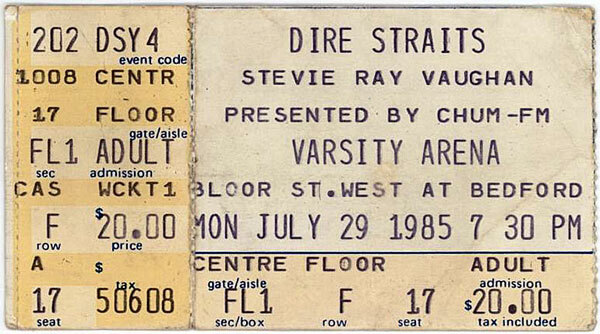 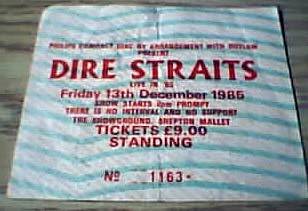 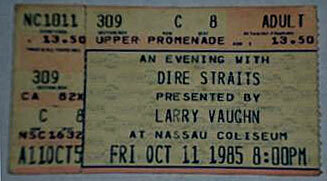 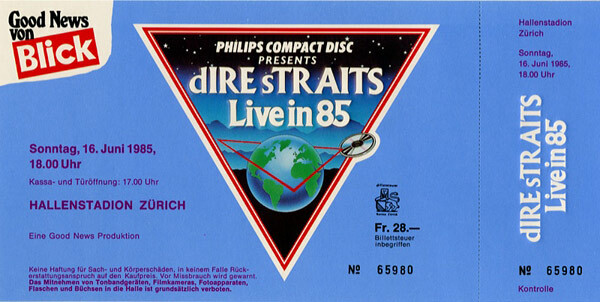 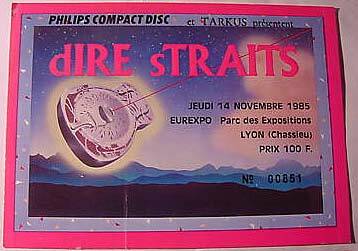 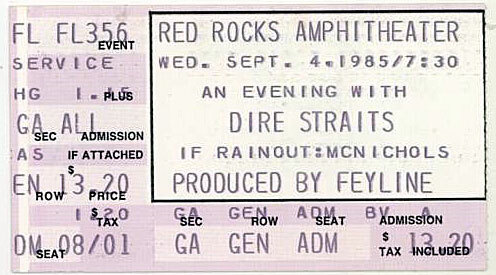 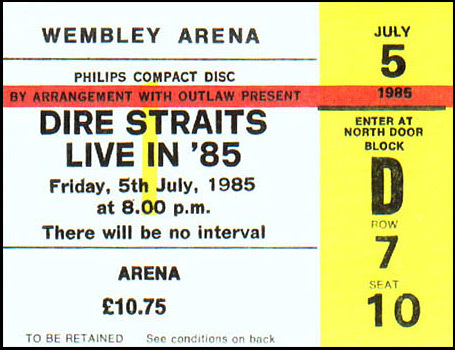 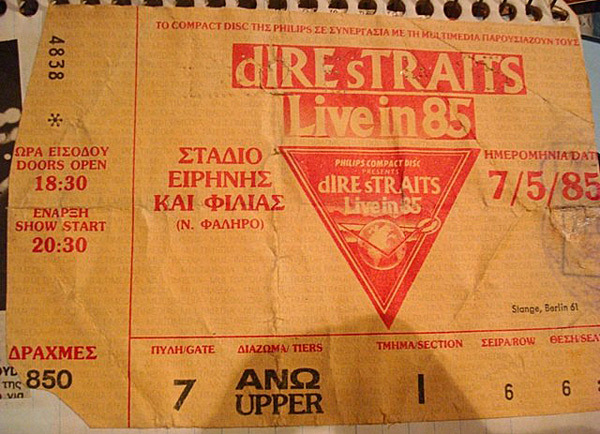 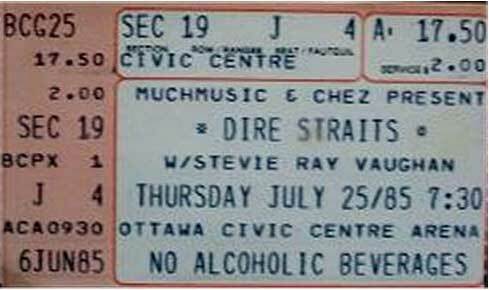 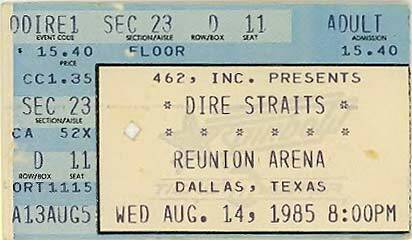 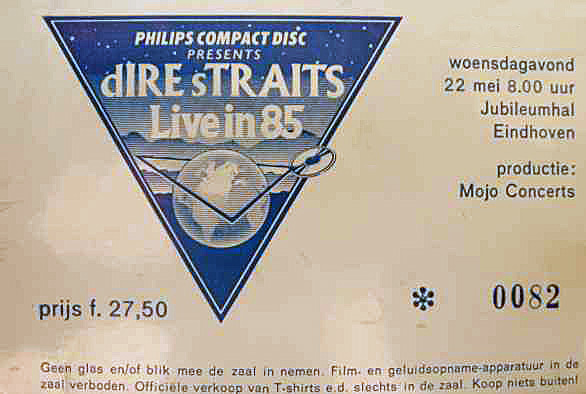 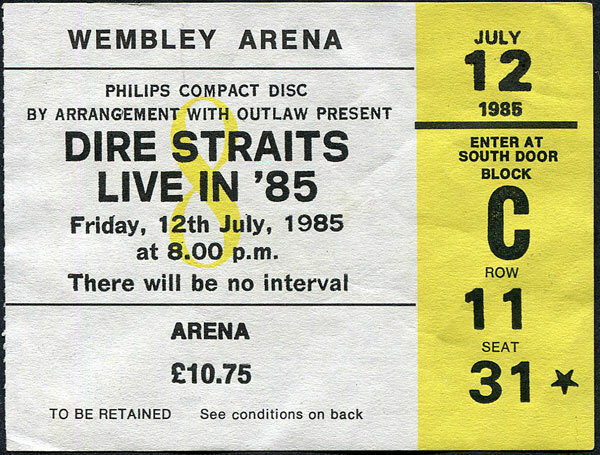 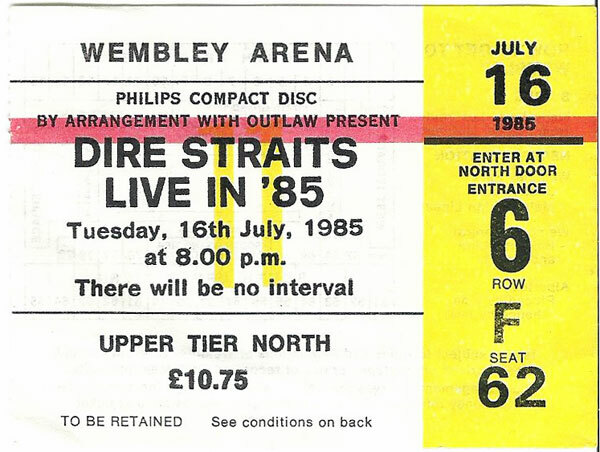 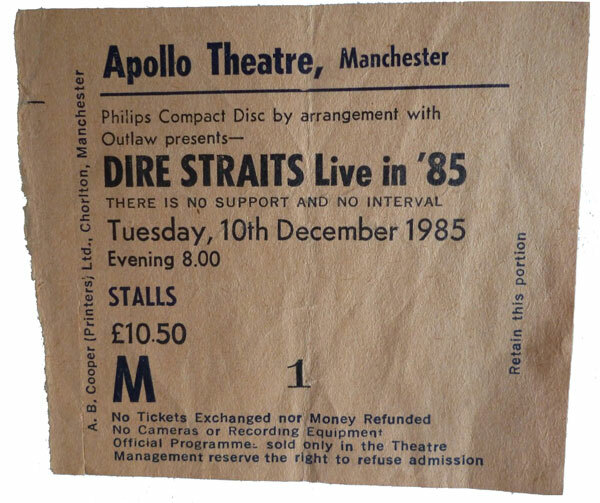 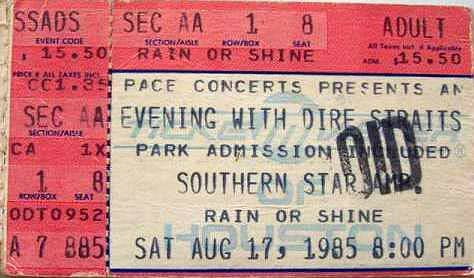 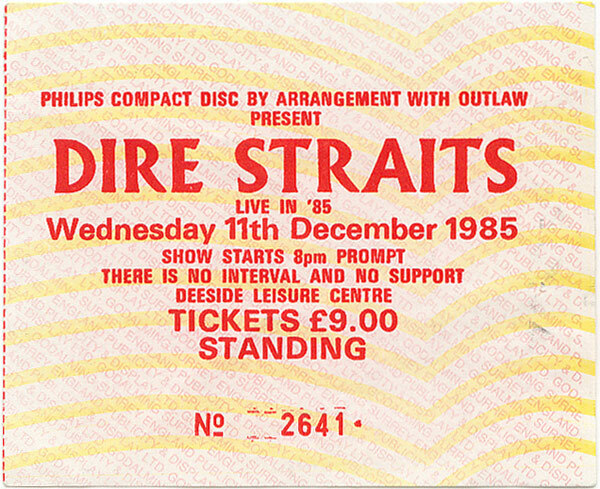 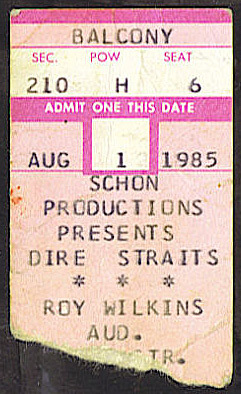 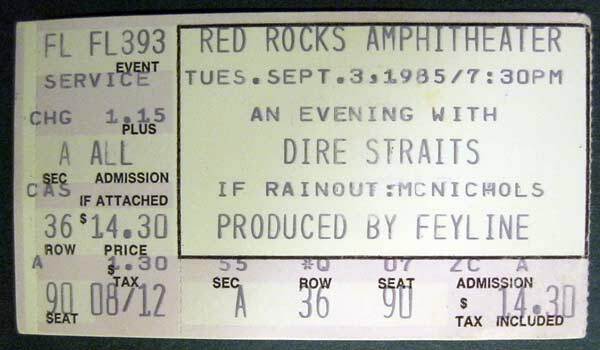 All shows were sold out and Dire Straits played to more than 2,5 million people alltogether (source: D.S.I.S. 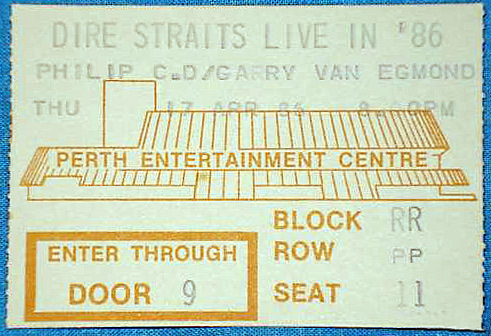 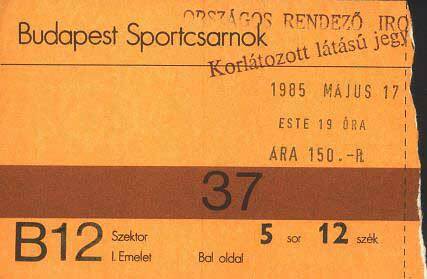 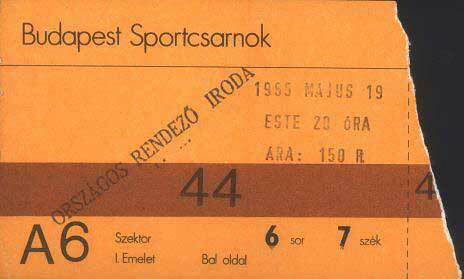 newsletter from May 1986). 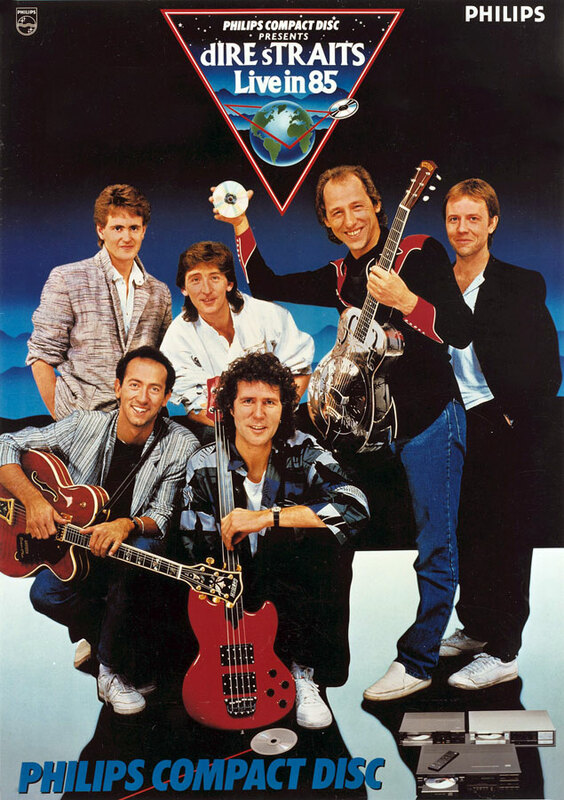 The D.S.I.S. 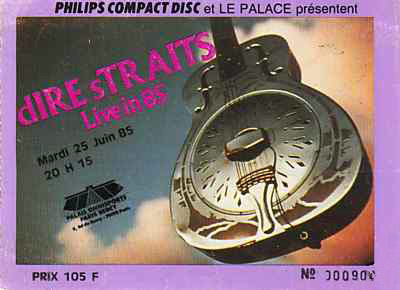 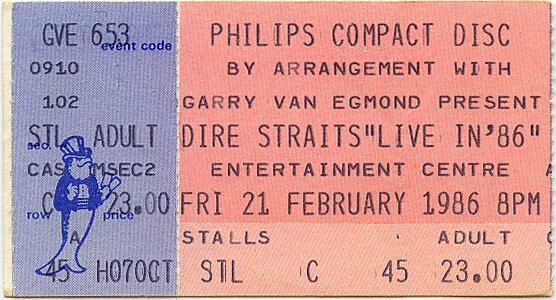 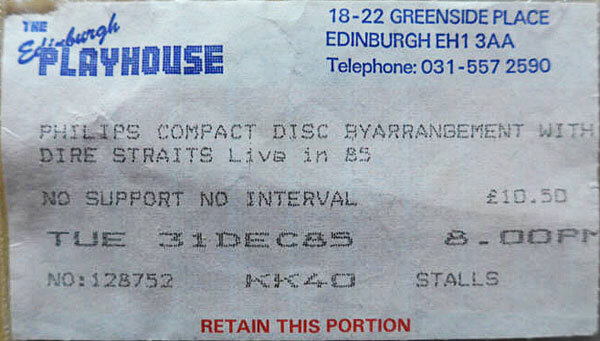 newsletter from February 1993 revealed that Dire Straits played 231 shows on the Brothers in arms tour. 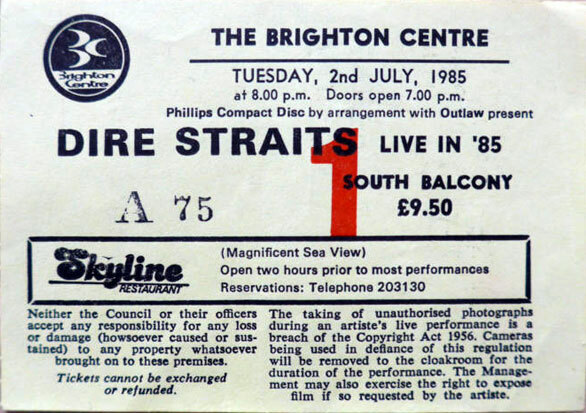 My overview lists 236 shows, so if anyone knows where I made some mistakes, I would be happy to hear it.